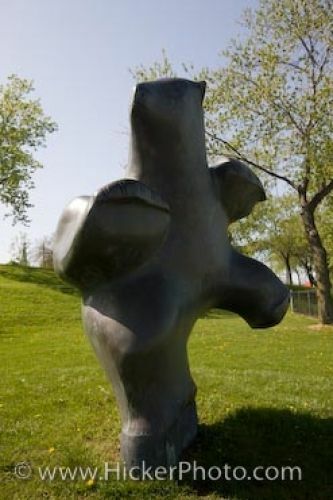 Created by Pauta Saila, an artist born in 1916 on Baffin Island, the Dancing Bear stands on exhibit in the Odette Sculpture Park (Assumption Park) in Windsor, Ontario in Canada. The Dancing Bear, made of bronze, stands 8 feet high and is a reminder of the power of an Arctic Polar Bear displayed in an intricate and simplified but playful way. Pauta Saila's work has been shown in hundreds of shows and is not only found at Assumption Park but many other pieces are displayed in public and private collections. The Dancing Bear is one of more than 31 large scale sculptures found throughout Odette Sculpture Park (Assumption Park) in Windsor, Ontario. The Dancing Bear sculpture by Pauta Saila in the Odette Sculpture Park (Assumption Park), Windsor, Ontario, Canada. Picture of the Dancing Bear sculpture on display at Assumption Park in Windsor, Ontario.